And the unknown (possibly Euphorbia cyparissias) is just getting started. 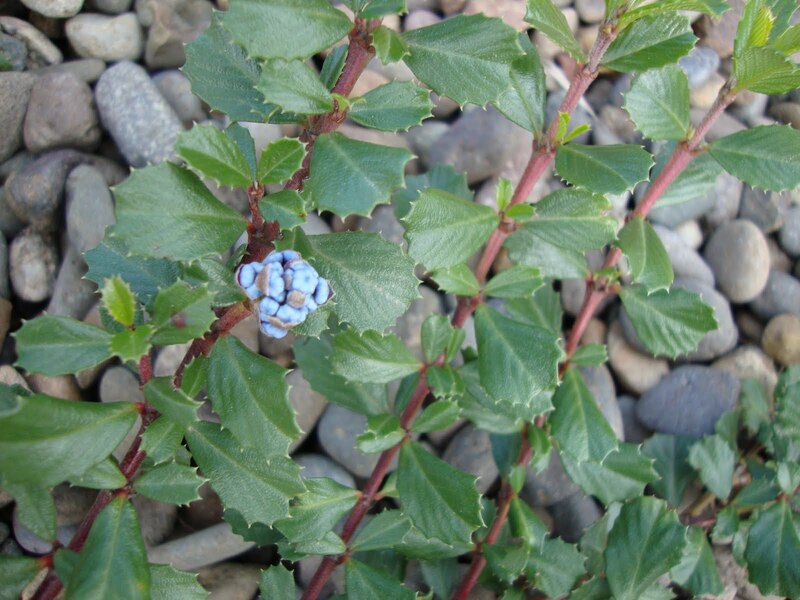 It can be a bit of a thug but is easily pulled out when it shows up where it’s not wanted. 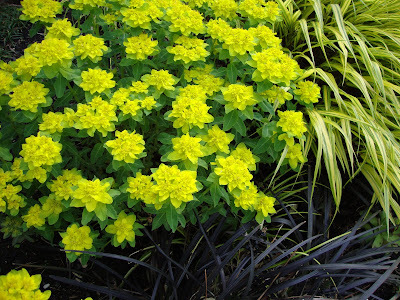 I thought it looked good growing up through the Sedum. 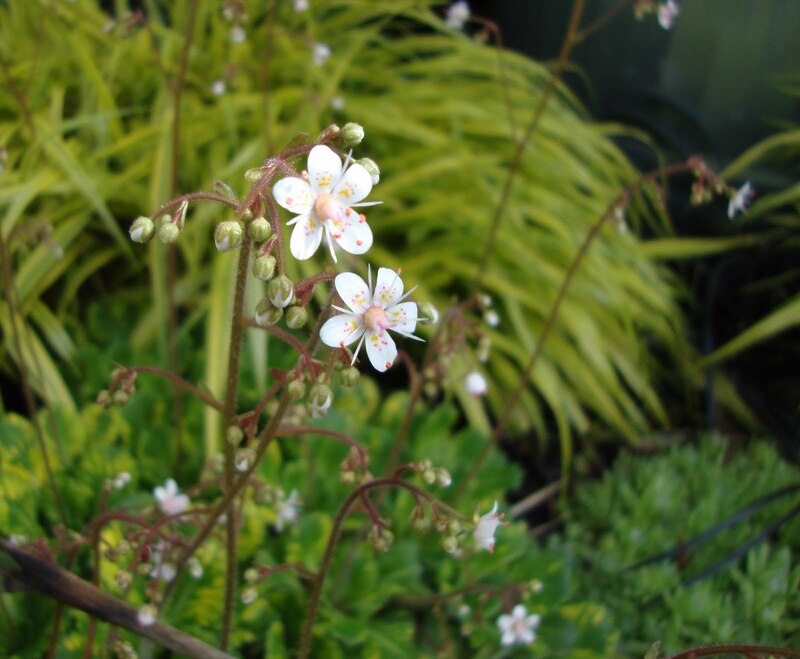 Saxifraga x urbium 'Aureopunctata' blooms are numerous. And they have about another week before they start to irritate me and I cut them all off. Things can get ruthless in the danger garden. The lone Tulip blooming is a brave brave soul. I keep seeing a flash of yellow out of the corner of my eye and think…gosh that’s a tall dandelion. 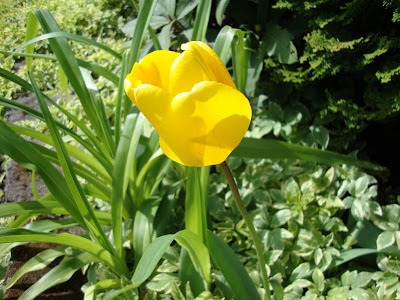 Before I absentmindedly pull it I stop to focus on it and realize it is a Tulip, and it lives on. 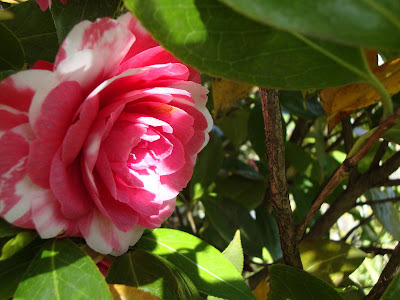 The Camellia is still opening new blooms; I think this is its most prolific year yet! The new Lewisia is blooming up a storm. 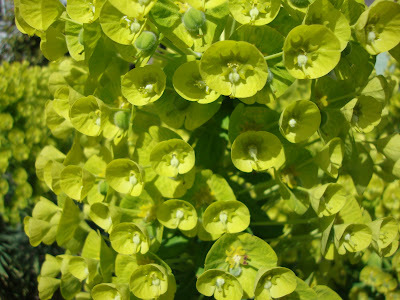 I bought it because I really liked the foliage; I hope I don’t grow to dislike the flowers. Wish me luck with that, they were supposed to be peach but they look awful pink to me. These white bell flowers were part of my inherited garden, I’m sure their name is painfully obvious to most of you but I’ve never known what they are. They seem a little late this year actually. 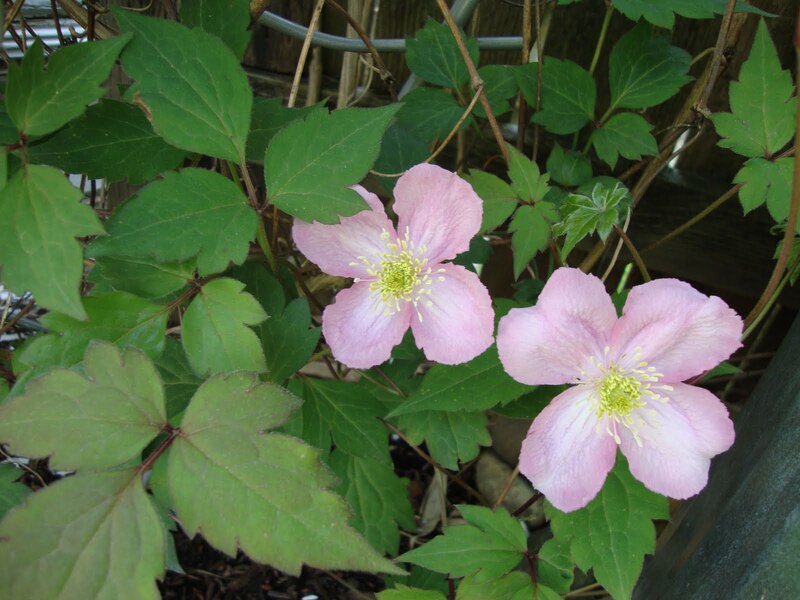 This Clematis is another inherited plant. 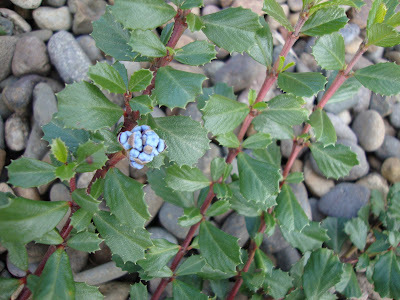 Although it was a mere twig hidden behind overgrown Rosemary (since deceased) when I discovered it. No longer, it is a vigorous healthy vine now, in fact when I went to take Bloomday pictures I discovered it was growing up and curling around and through many of the bamboo stalks, and in fact pulling some of them over. This picture is about 8 ft up off the ground. Luckily I caught it in time unwind it and save both the Bamboo and the Clematis vine. And lastly, my fav, the Echium candicans. It is my dream to someday have a huge shrub that blooms its heart out (I guess that means I'll be moving to California), but for now this single, fabulous bloom spike will due. Curious about what else is blooming out there on this April bloomday? Head on over to May Dreams Gardens for the full line up! Your flowers are beautiful! And so different from what we have here in the south east. The purple spike plant is awesome! Your garden is wonderful. 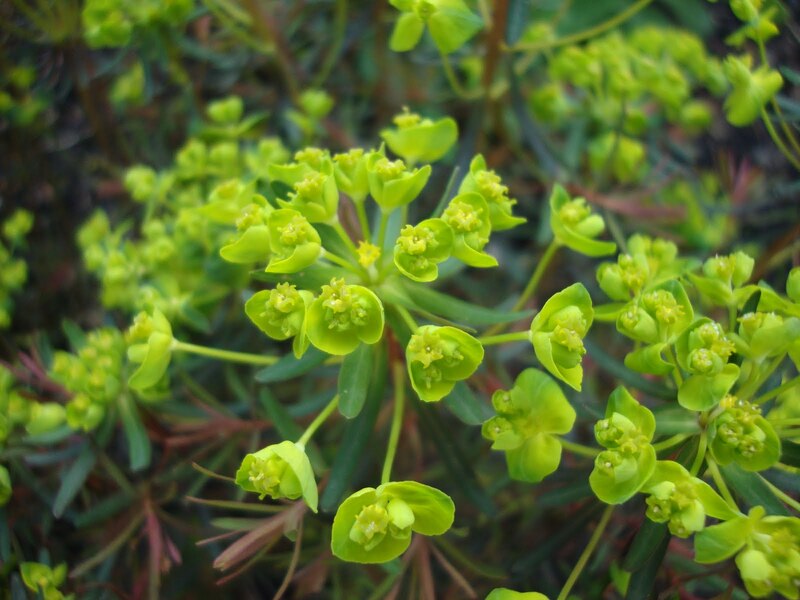 What a wonderful collection of euphorbias. I can see why the Echium candicans is your favorite. What a wonderful bloom! Loved seeing this different garden and look forward to more. Those white bell flowers seem to show up in every inherited garden, and they spread like wildfire. 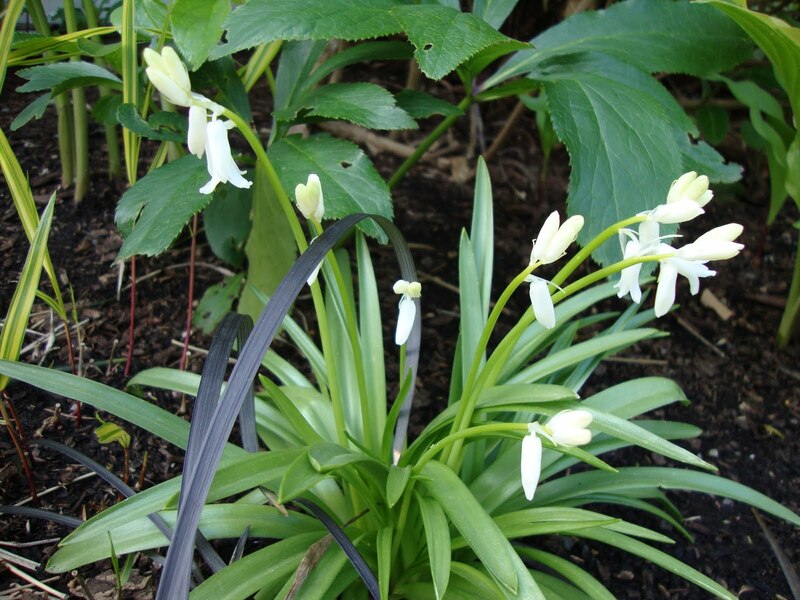 My mom always called them scilla, but I just looked them up in my Scheepers catalog, so here goes:Puschkinia scilliodes var libanotica alba. 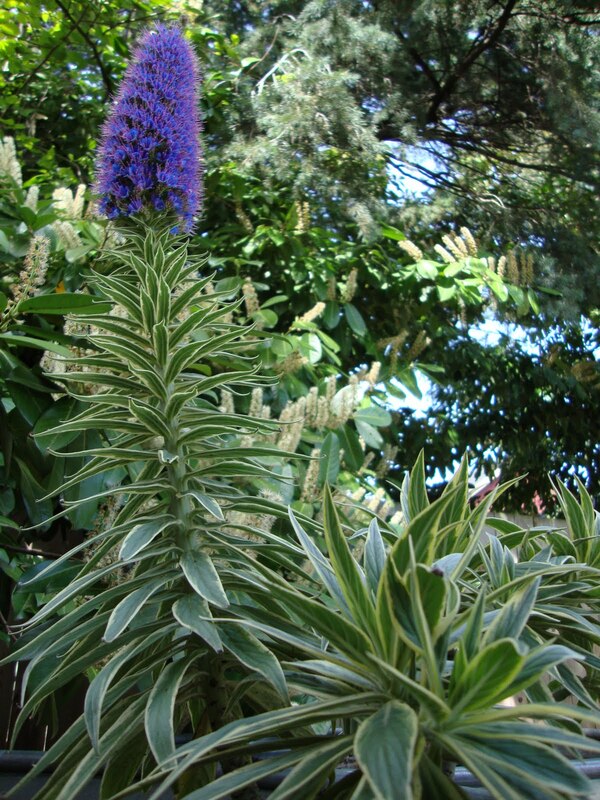 I should think that Echium could go up against anything they grow in California. Spectacular! The echium is sublime. I had no idea they would bloom this early up here! Lovely to see your ceanothus in bloom already - that Point Reyes is a gorgeous low form. And I'm kicking myself for only now moving back into euphorbias. An early experience (I think it was cyparissias) left me nervous about invaders, but that green is so intoxicating! At least your Echium candicans has a flower. I planted one over a year ago and no flowers. It's gotten huge, but I'm starting to get a little crabby with it. Have you seen Annie's new red Echium russicum? I NEED it. Magnificent Euphorbias! And the depth of colors in that Echium - great closeup. How about another comment on the Echium, WOW! Ah, with that euphorbia and echium in bloom, you don't need anything else to flower. Just beautiful. I know what you mean with the euphorbs--I bought several a while back and now have seedlings coming up everywhere. They're awfully spectacularly right now, though. 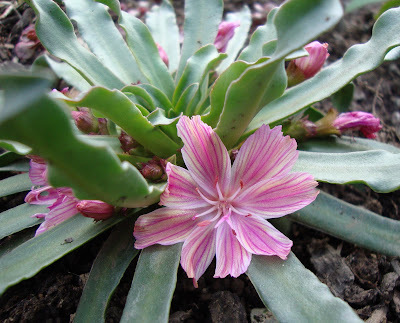 And yes, the lewisia isn't pink, but I do love the subtle veining on the petals. I am such a curmudgeon, my Echium bloomed too, but I wanted one more like the other Megan's. Huge and leafy, no flowers. We should probably trade. I still have hopes though that once the flowers go, I'll get the huge foliage plant of my imagination. I realize I'm in the extreme minority here. Sometimes I think it's a shame someone else already snapped up the blog name "the grumpy gardener"
Your garden is so different. I always love a visit to see what new, weird plant I will be introduced to! 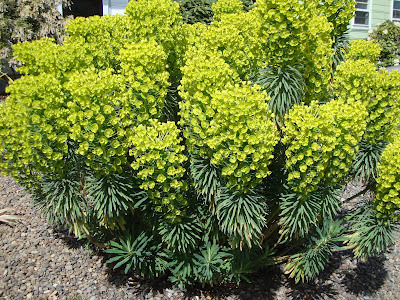 -- Euphorbia characias ssp. Wulfenii! Love it! The Brick Cottage, thank you, and thanks for stopping by! Snap, glad you understand my obsession! ricki, thank you for the id! I remember being concerned the first year they come up, thinking that they looked like a spreader but they've really been well behaved, the die off in a month or so...maybe that helps to keep them in check? Mulchmaid, I am so happy to hear that the Euphorbia are winning you back. They really are very easy to control, even the thuggish ones are easily dealt with. I must admit the Echium had a bloom forming when I bought it. Cheater! 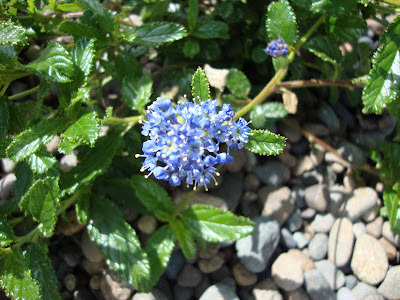 Megan, I bought a couple little seedlings of Echium russicum today at a plant sale...I am very excited! Les, I almost bought another today. But I was a good girl and instead bought 2 of a different variety. Pam, you know you're right. I need to move them closer together, that would be a fabulous show! James, I don't think I've ever met a Euphorbia I don't like. Megan, you get to excited about things to be the Grumpy Gardener, it just wouldn't have worked. Sylvana, that is a huge compliment! Thank you! 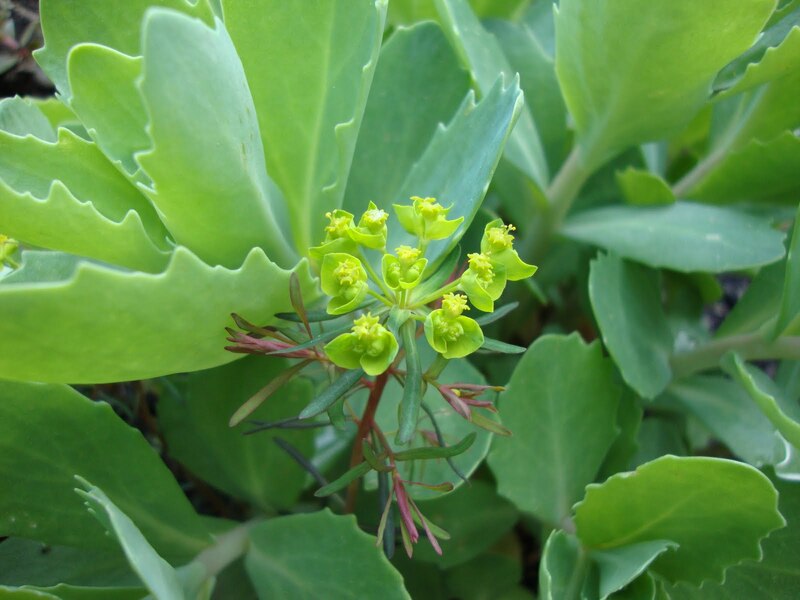 I fell in love with the soft texture of Euphorbia cypar. years ago. It's a thug all right but I still love its charm, wending its way through grasses and well, everything. I pull it up and get the milky stuff all over my hands. Then I take the clump over to another part of the garden and replant it while secretly wondering if I'm losing my mind. ... The flowers are refreshingly fragrant too.